On Thursday, July 14, 2005 we departed from the Paradise RV Park in Winfield, TX and moved into Indian Country. We did not see any Indians, but if I remember from my western movies that is when you know they are around. We were headed about 250 miles north and to New Castle, OK, which is just south of Oklahoma City. We took US 271 north in the rain with intense lightening, driving through Paris, TX, then Hugo and Antlers in Oklahoma. The lightening went away and the rain stopped near the state border, but it stayed overcast all day. We then went northwest on Texas 3 through Atoka, Coalgate, Stonewall and Ada. 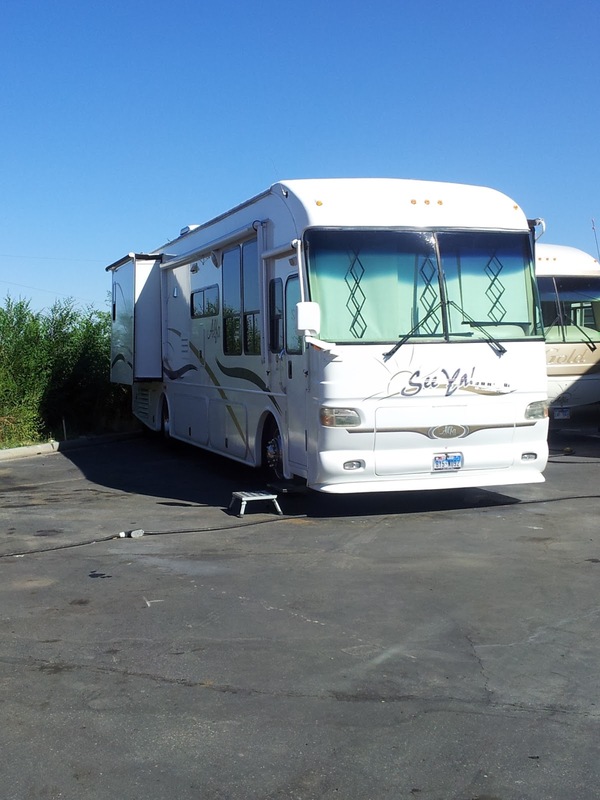 When we hit I-35 we went north toward Oklahoma City and stopped at the A AAA RV Park in New Castle. You know with a name like A AAA, this had to be a class place and it was. The rain afforded us some cool weather and I tried not to notice that the motorhome was filthy. 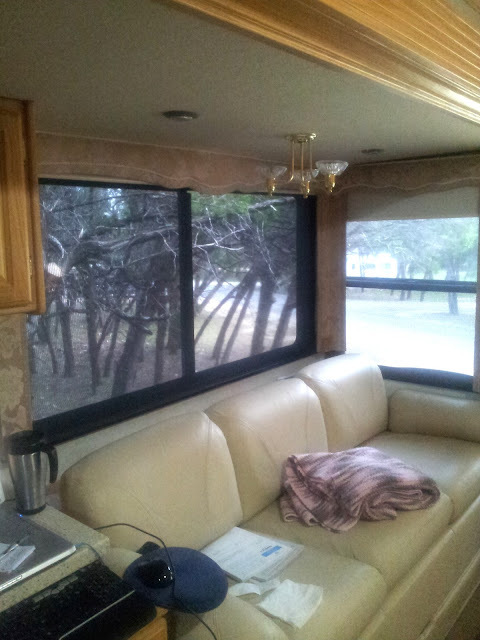 A little rain and the dirt and mud from passing vehicles seems to jump on the white paint of our motorhome. On Friday, Kathi called her aunt, Alma Welch who lived in Oklahoma City. We drove over and visited with Alma, her Daughter Sally and Sally’s daughter, Erika. Alma and her family lived just behind Kathi part of the time they lived in Pasadena. While growing up Kathi babysat, with all of Alma’s children, so she was pretty close with her aunt. Aunt Alma was in a wheelchair, since she had a stroke a few months earlier and could no longer walk. Aunt Alma always had a lot of nervous energy and she still had it, because she moved her wheel chair continuously, finally running the battery down before we left. It was a nice afternoon and we all enjoyed the visit. After leaving the Welch home, we found a small casino. I managed to turn my $20 into $150 and volunteered to buy lunch. We found an On the Border restaurant and enjoyed some great Mexican food. I have beef quesadillas and Kathi had a Grande Taco Salad with no meat. Saturday we went to the Thunderbird Casino in Norman. They took all the winnings I had from the day before, except for the price of lunch. Kathi did not have any luck either, so we did not stay long. We had Red Lobster for a late lunch on the way home. We enjoyed lunch and both had leftovers to take home for later. Sunday morning we got an early start to go another 250 miles north into Kansas and moved to the Lakeside RV Park in Assaria. We took I-35 north through Oklahoma City, Edmond and Perry before crossing into Kansas. We went through Wichita and changed to I-135 in Newton. Next came McPherson, Lindsborg and Assaria. The highlight of the trip was all the wheat fields and farmers cutting wheat. Agriculture in action is fun. It was warm out so we got set up in Assaria and stayed in for the rest of the day. It was nice to be in Kansas and moving again on our RV ventures. 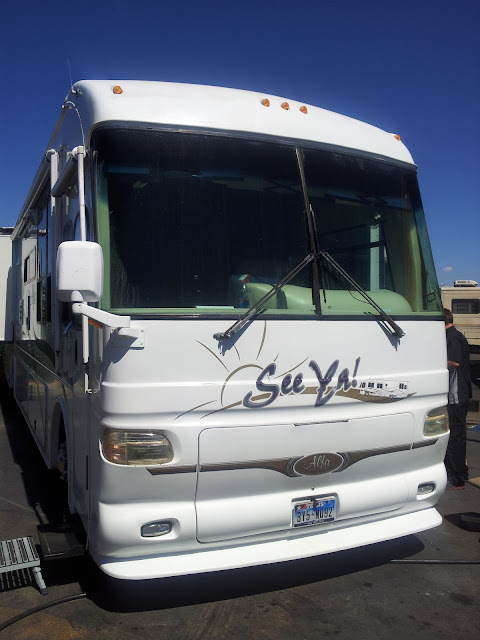 Below are some pictures of our motorhome. Picture of our Alfa at Charlie's Service Center in Sunset, Utah. This picture of our couch was taken at Lake Georgetown, Texas. 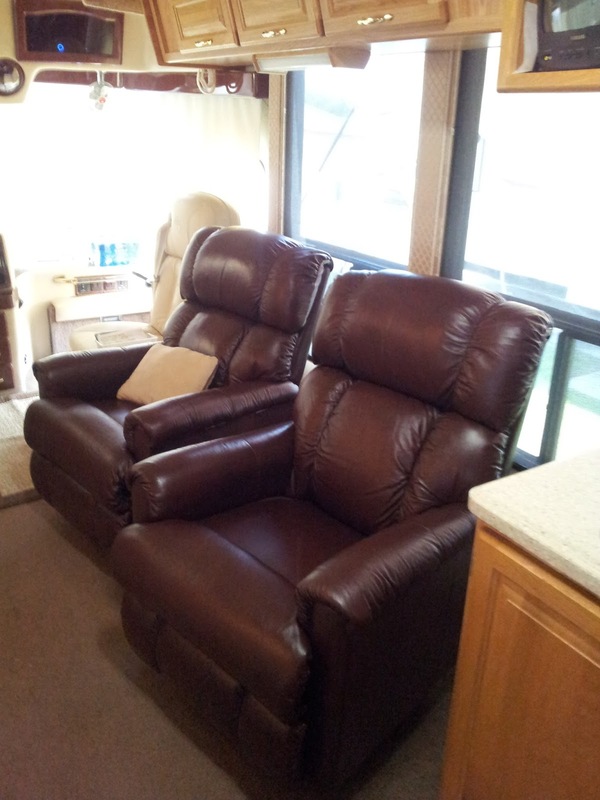 Our La-Z-Boy Recliners. Very comfortable.